A much-needed and fun refresher for Blizzards card battler, although the next card expansion will need to be more sizeable. Between all the bitching about which cards are OP and need nerfing, it's easy to lose sight of what a remarkably fun, balanced (yes, really) and young game Hearthstone is. By the time it left open beta in March it already had 10 million registered players smashing each other's faces in with ever more creative card combos. Since then, despite gripes about RNG, as if any card game doesn't rely heavily on lucky draws, it's on the verge of exploding as an e-sport, with regular tournaments offering big prizes and a thriving scene of pros and streamers. But Hearthstone also had a problem: the cards. There were 382 collectible ones in the initial pool, and although that sounds a lot, prior to the release of Curse of Naxxramas the metagame—the way that the most popular decks counter each other, and fluctuate in popularity as a result—had become stale. The ranked ladder was dominated by a small number of archetypes, (Double-Combo Druid, Miracle Rogue and— ugh! —Zoo Warlock), and an oppressive trend for doing enormous bursts of damage direct from the hand. Many players had begun hearing the clarion call of Leeeeeeeeeeeeroy Jenkins arrival in their nightmares. Blizzard's answer was both obvious and innovative. An injection of 30 new cards, released as unlockable rewards for beating bosses in a single-player adventure themed around a classic World Of Warcraft raid. And so, over the course of five weeks, the spooky denizens of the floating necropolis of Naxxramas were pitted against the community's deck-building skills. It's relentlessly creative, if not hugely challenging on 'normal' difficulty—which was intentional. 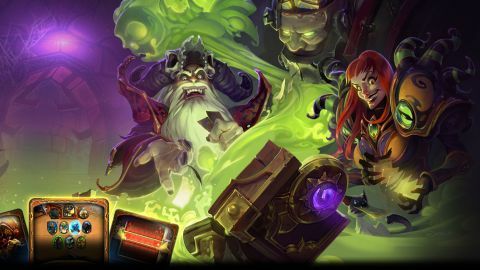 Normally, to be competitive at Hearthstone you pick 30 cards capable of combating many different kinds of deck, but in Naxx the matches are more like puzzles because you know exactly what you're facing. Each boss has its own intentionally ludicrous hero power and bespoke cards, and it's up to you to construct a strategy that exploits whatever chink remains. For instance, the fight with Pacthwerk, a sewn-together abomination who doesn't play minions but is armed with a giant meathook, becomes a straight DPS race. You might try to stave off the pain by playing creatures with the Taunt ability, or look to use cards with the Freeze ability. Elsewhere, Grand Widow Faerlina fires rockets at you based on the number of cards you're holding, so an 'aggro' strategy that relies on dumping your hand is fruitful, while Loatheb has a vast life total you have to whittle down. Luckily he drops spores that buff your minions, if you can keep them alive long enough. It's relentlessly creative, if not hugely challenging on 'normal' difficulty—which was intentional. Having paid for Naxx, either with actual money or in-game gold, Blizzard wanted everyone to be able to access its cards. For those seeking a sterner test, Heroic mode ramps the bosses abilities up to eye-watering levels, with a unique card back on offer for clearing all 15. Less successful are the class challenges, which have you fighting the same bosses again but using a pre-built deck to earn a new card for each of the game's heroes. The standout here is the Hunter encounter, which only gives you Webspinners to play, but others feel clunkily balanced. The Paladin challenge, in particular, is a ballache which relies on having a lucky starting hand to stand a chance. A strange thing to score, then, given it's drip-fed delivery, but in terms of value I have no hesitation recommending Naxx. The new cards are mostly so useful that I actually think it represents a good place for first-time Hearthstoners to start. As for how they've refreshed the metagame, well, that's a little more complex. The answer is probably: be careful what you wish for. While the previously dominant decks now see less play, they've arguably been replaced by an even more pernicious overlord. Having previously fallen out of favour, Hunters are back in full force 'thanks' to new cards like Mad Scientist and Haunted Creeper. It's pretty hard to say we're any better off, but it's exciting that the game is in flux again.